See things from Christy’s perspective. After a restless night’s sleep, my foot was still hurting madly so headed out to the hospital for an x-ray. I’d been researching online about strains and sprains to know how long I’d be laid up, what to could expect. Andy got a wheelchair from hospital staff when we arrived there. (I think nobody there could stand to see me hobble around either.) How nice that felt to not have to walk! It also ensured I was sitting when the x-ray came back. I sort of just stared at the doctor in disbelief as he showed me the breaks. How long will this take? Some absurd estimates were thrown around and ended with me understanding that if I screwed it up, I might need a surgery to line up the bones again. So far, it was the luck in this misfortune that the breaks were clean and not displaced. And I get to make a choice (yippee! )… a solid plaster cast for 6-8 weeks or a stiff removable boot that I have to wear day and night at first and then see how it progresses. That was an easy one. We went on a little shopping spree at the orthopedic supply shop down the road for a new boot and threw in some crutches to go with it. More difficult choices were ahead. We left the hospital and I had no idea how we were going to continue our trip. We wouldn’t be sitting it out in Coyhaique. Stopping or going home didn’t cross my mind, I was too busy trying to figure out how we’d continue on. After about a week of what felt like denial, I started researching for a local orthopedic doctor. We had questions we were too stunned to ask initially. I came across a blog of a pair of world travellers on a bike and got in touch with Ivana. She had broken her leg and was treated in Coyhaique a couple months earlier. She had a surgery to insert several pins in her leg and after several weeks, had continued on south by hitch hiking while her partner continued on their bike. That’s tough! Ivana was encouraging, and informative about the local doctors. I’m glad we’re in touch now to follow up how the travels are going. In the meantime, they are riding two-up again somewhere in the Atacama desert. Two weeks passed quickly while we were doing a bunch of absolutely nothing. I was content with my small trips around the cabin. Oh yeah, and we got a cabin! The hostel owner couldn’t stand seeing me go up and down those stairs any longer, so we were moved to a cabin across the street. ‘Twas the Christmas season and all… Very kind of her! So we had a cozy little fire, Andy stocked the fridge, and my days consisted mainly of wobbling from the bed to sofa. That sofa is really memorable. I would just sink in and prop up my foot. When I was on FaceTime with Julia, she remarked how it looked like I was in a sea of roses. Yep, the pink posy print matched the curtains. But the sofa had seen better days. The cushions were worn out and rising from it was like lifting myself out of a deep hole. Everyone without crutches looked stiff and old getting up from it. With my crutches, I felt like a giraffe, so it was good for a smile or laugh every time. Strangely enough we didn’t really go stir crazy. We just kind of chilled out and were astonished how two weeks can slip by nearly unnoticed. There were still quite a few highlights to come in the area and we wanted to get out exploring again. We just had to figure out how. In the best case, we’d be able to travel together or at least sort of coordinated so that we could see and experience sights at El Calafate and Torres del Paine together. We could park the bikes and rent a car for a couple of weeks, but then we’d have to come back to Coyhaique and riding out of their meant dirt and gravel roads. I had no idea how long it would be before I could manage just any kind of unpaved road well again. We’d also have to get something worked out for the board crossing and customs since we’d exit without the bikes that were noted in our passports. It would all be possible, but this didn’t quite feel like the right solution. I started looking into the many boat options around. If we could find a cruise operator that had a ship equipped to roll the bikes on, maybe we could just set sail for the south to Punta Arenas or Ushuaia while my foot heals and then ride back up north. It would allow us to travel together and would add a pretty neat aspect to the travel. We both enjoy boats and this would be an unforgettable way to see the icebergs and fjords of the region. Bot the cruises are not only pricey, they also fill up quickly and don’t have the flexibility we’d need to take the bikes with us. There are some online travel groups, but I decided to start small and just send a few quick notes out to people we’d met along the way and other travelers we know. No familiar overlanders were nearby, and we didn’t meet any in town with similar plans. Sonia from Motoaventura told me that the paperwork to transfer my bike over the boarder to Argentina by someone else would be a hassle at the notary, especially around the holidays, but they could transport it within Chile if that would help. She also gave me the number of their contact person in Coyhaique, Rolf Traeger. We got in touch and it turns out, he’s a biker and has a car rental company. That got us thinking. How about we put our bikes up on the back of on one of his rental 4×4 pickups? He agreed. After a short discussion about how to do it, he and his team spent half a day welding a frame and tracks into a truck, then they helped load up our bikes and we were on our way. We could take the truck one way to Punta Arenas, Ushuaia, or elsewhere. This solution really fit the bill: we’d get to travel together, the bikes were with us, we could be flexible and it added a really fun aspect to the travel. amazing! this is just right out of Coyhaique. We’d been riding two days in cold pouring rain, followed by one with sidewinds and gusts of up to 80 km/h. At least our clothes were finally dry and it was a relief to get out on the road in fair weather again. The Carretera Austral is a picturesque and special road, with mountains, fjords and glaciers all around. It is connected by ferries to the regular Chilean road system and in this region, it is the only north/south road. They say if you are trying to go fast, you won’t get far. You have to take it easy and go with the flow here. The conditions of the road seem to have changed a lot according to accounts I’ve read. It’s in pretty good condition and improvements are continuously underway. We left the Carretera Austral briefly on a little jaunt out to see Futaleufu and back, but as we returned and continued south, we were warned by oncoming travellers of a roadblock ahead. It’s normal to expect construction and even regular daily closing times in some sections. This one, however was different. There was a rockslide and no one knew how long the closure would last. It would only be possible to open again if the rain would let up and that didn’t look likely for a few more days. We decided to track back again, covering the road off to Futaleufu a third time in order to cross over to Argentina and continue south a bit. We would cross back over to the Carretera Austral at the next chance. Our detour took us through the unremarkable Argentine towns of Tecka and Rio Mayo. The ride between these two places was paved but quite often difficult. Westerly winds swept us into a slanted position all day. It was a bit unreal. We had experienced strong winds in the desert and on the coast of Peru, but in this vast open flatness, the wind seemed even more brutal. Whoever rode second got the best view of how crazy the wind was and that’s how Andy saw me leaning just a little bit to the right in order to make the left curve. Luckily there were few curves and even less passing to do. The gusts just made it very tiring. Rio Mayo was our first chance to cut back over to the Carretera Austral and we took it. I was eager to get back to that beautiful, enjoyable, legendary road. The route from Rio Mayo, Argentina over to Coyhaique, Chile isn’t paved and it promised to be a long afternoon of dust and gravel. Despite sleeping in what might has well have been a jail cell (seriously, we had view of a bricked in-window). I was in a great mood, happy to return to one of our trip’s highlights. We didn’t know yet where we’d be for the holidays and with all this warmth and sunshine, it wasn’t feeling much like Christmas, but for some reason I was giddy, singing carols anyway. The road required a lot of concentration, because it changed quite quickly and unexpectedly. Some parts were just normal gravel, some a bit deeper with big grooves to navigate, but some areas were very surprising layers of large rocks piled up on one another. I found the best way to deal with these surprise patches was similar to how I managed the slipperiness of sand: roll on the throttle a bit, lean back and get it steady. The bike might swerve a little right and left, but we mostly had the road to ourselves, so there was nothing to fear really. It was working out well and this day seemed perfect. It was about halfway to Coyhaique that my bike became unstable, I couldn’t make the save and I fell. It happened really quickly, a right-left-right-left over big smooth rocks and I about had it, but then it seems hit the one rock in the road which wasn’t moving, my steering turned and I was sliding sideways on the right side with my foot pinned under the bike. My leg was turned back, my foot was being dragged under the foot peg and I had a pain in my foot which I knew wasn’t good. I remember thinking that this would have to change soon, I couldn’t take this position much longer. About then, the bike popped up for a split second, my foot was freed, a 180 degree turn was completed and the bike bounced from the right pannier, then landed on the left and that was it. I got off the bike and just wanted to remove my boot. I poured some water on my foot and laid some of the cold rocks around it for a few minutes. It hurt badly and it was swelling, but I could still wiggle my toes, so I assumed it wasn’t broken. I had never broken any bones. The leather on the front top of boot around the big toe was badly scuffed, so I thought maybe it was just a bad sprain from the twisting. We had about another 100 km to go in either direction. Return to Rio Mayo? I couldn’t even think of going back over that horrible stretch of road again. Coyhaique is sort of isolated over on the Carretera Austral, but it should be a town big enough to have whatever we need, so I wanted to continue on. Riding was tough. Singing helped. Standing was difficult, only possible if I put most of my weight on the left foot and only had my heel on the right peg. When sitting, I could kind of brace myself and hold my right leg out away from the bike to avoid feeling the big bumps. Stopping at the boarder crossings and trying to walk was the incredibly painful part. Walking was not working. Soon though, there was paved road into Coyhaique, at least it was a smooth ride for a little while. Andy did the checking in at a hostel. Our room was upstairs. I was moving slowly, not knowing how exactly to get up there. The receptionist looked at me strangely and asked if I was sick as I hobbled sideways up the steps. “Si, un poco.” I didn’t have words to explain in any language, I just wanted to finally lay down and call it a day. taking in the vast landscape as we got started. no rain, less wind, this was going to be fun. here i’m singing christmas carols and having a great day on the bike. we’re returning to patagonia after a windy day on argentine pampas. the road changed a lot. sometimes there were nice tracks, sometimes deeper gravel. i nearly saved it, but there was a solid rock that changed my course. back in the saddle, still singing. the landscape was pretty all day. I always keep an eye out for wildlife. Just because my foot hurt didn’t mean I wouldn’t stop to watch a hare hidden, nibbling on the grasses near the road. look at this view! the 100 km after the fall were tough, but totally worth it. You never know who you’ll meet. Travelling on a bike increases the number of people to chat with immensely. It’s nice. No asks “where you from & where are you going” to people driving cars, but very often, when you stop the motorbike, friendly people appear. Somewhere in the north of Chile, on a stretch of desert highway south of Calama, we stopped for fuel and guy jumped out of a truck next to us and introduced himself. Cristian is a friendly guy, curious about our trip and he told us about a German volunteer fire squad in Santiago. He suggested we stop by when we’re there and he’d show us around the fire station. A German firehouse? Sounds interesting. Cristian noted the contact details for the 15. Feuerwehrkompanie in Santiago on our blog. When we arrived in Santiago, our first priority was getting our bikes in for service, but I remembered Cristian’s offer and was curious to check out the fire station. Our bikes were in service and looked up the location. Turns out, the Los Dominicos station was right on our way to the BMW dealer. The next day we started off a little early to pick up the bikes and stopped by to have a look. We were unannounced guests, and unfortunately, Cristian wasn’t there. His friendly colleague, Boris, gave him a call and found that he was out of town. Boris was friendly and welcoming, and showed us around the station himself. It was amusing seeing all the “German-ness” right there in Santiago. The station has a super facility and walking around there, it felt as if we could be anywhere in Germany. They even speak some German. This “freiwillige Feuerwehr” (volunteer fire department) is similar to the model in Germany. Thanks to Cristian and Boris, we were able to experience their hospitably and learn about their proud fire station. Is this Berlin or Santiago? Are we still in Santiago? We didn’t get to turn on the sirens, but we did get to see inside. Boris told us all about their work and firefighting in Santiago. There was a guy in the next room studying, but he’s on duty. If necessary, he has to be ready to go and every second counts. It’s certainly not the most romantic destination, but when we decided on Chile instead of Argentina upon leaving Bolivia, I knew just where I wanted to go — Chuquicamata! It’s not everyday that you can just stop by one of the biggest open pit mines in the world. It’s not on the list of UNESCO’s World Heritage Sites, but this active mine is a testament to human ingenuity and development. The volcanic veins of magma which have formed these hills of the Atacama contain copper. American mining companies discovered this here over a hundred years ago. Since then, operations were transferred to the Chilean State, but the mining hasn’t slowed down a bit. Today, a third of Chile’s economy depends on copper. Mining is a fascinating and somehow horrifying industry. This is a place of absolute superlatives. Trucks larger than in your wildest dreams, moving weights unimaginable to get at a precious metal. Well, in the case of copper not technically precious. This base mental has a current spot per pound of just under US$3. In it’s path, mining leaves behind huge waste and destruction. But we all want our stuff… Christmas lights, phone cords, electronics of all sorts, including whatever device you’re using to read this blog, contains some copper. Environmentally, the place is a nightmare. A mere one percent of the rock they extract here is actually copper. Some additional gases and minerals are yielded in processing and we were credibly assured that nothing which can be sold goes to waste. The guide admits they haven’t really found a good solution for the dust which results after the rocks are pulverized, and water is a real issue. Situated in one of the driest deserts in the world, the Atacama, water is a serious problem. Massive amounts are needed to process copper. On the tour, our guide told us that a new law was passed that only allows mines to use sea water for processing (background). Water trucks are everywhere along the highway (don’t even begin to think about the carbon footprint the exhaust of all this is causing…). In Chuquicamata, they have set a target to move operations underground to exploit the new finds located below the current pit. The massive trucks will stop burning their diesel at three gallons a minute, and instead conveyors will lift the rocks to the top. Nevermind the fascinating eyesore the mine creates. Deserts are wonderful, magical places, but this area isn’t particularly beautiful. It’s hot, dry and I imagine if weren’t for the mine, nobody would want to live here. The sandy landscapes we drove through past Calama were mostly interesting because of the mining activity. No place to put all the leftover rocks, so they just got piled up on the town. Seems it was Christmastime when they closed up the town. Our guide at the now museum. I think it was a library built by the Americans in the town’s beginning. They had a nice collection of old stuff on display. Here about the then super-powerful diesel motor. The current Liebherr has 3,650 caballos (hp). Our interesting guide. A local guy who actually grew up in the town. He told us all about finding, extracting, concentrating, smelting, refining, selling and transporting copper. I guess this is a picture from the farewell to the 92 year old town. Even if the lovely town could make you forget where you are, the landscape always reminds of the mine. Saddest playground I’ve ever seen. Christmas Cheer all around the desolate main square. Main Square Gardner. Are they doing this for us? Back in the day, this was the entrance to what was one of the most advanced hospitals in the Americas. If they hadn’t found more copper near the town, it might still be there today. The first big one we saw from the bus window. Up close, the tires were up to the top of the luxury travel bus’ windows. Refinery and parts we didn’t get to see up close. Long clothes, hardhats and safety vests required to visit the lookout at the mine’s precipice. One percent of that load is the stuff they actually want. The trucks run 24/7; down, then up at what looks to be a snail’s pace. A couple scoops, it’s filled up and time to head uphill again. It’s huge and the copper goes on for at least another kilometer below this, but at least for the current pit, this is the bottom. Tiny matchbox pickup behind about 16,000 tons of rocks rolling uphill. They keep passing by, but they never cease to amaze me. Nice way to reuse the huge tires. In a way, it reminds me of the pyramids in Giza. Didn’t need that building anymore either, I guess. Nice color variation seen in real life after the explanation of our guide. A fleet lined up and ready for 60km/h action. They have started a new mine outside the old one. This promises at least another 50 years of prosperity. Wow, look what we found! There is sand in the bottom of the swimming pool. Of course there is. They can clean it as often as they like, this is the desert. High sandy mountains rise up around us, lost a bit in the hazy morning air. The roaring trucks on the motorway suggest they have contributed to these milky hues. Despite the traffic and frantic horns of the mototaxis, it’s quiet and peaceful here. It is a paradox for the senses, the sound of the road and the calm of the lush garden here, half a mile away. The body relaxes in the warm, calm wind, with the sound of palms in the breeze, cheerful chirping of tiny birds and the cooing of doves on the rooftop. In the night, the horns stop but the constant droning to the city continues. There are nine million people there who want fresh food and industry awaits precious minerals from inland Tarma and the Central Highlands which is at the other end of this dusty road. While dozing into the night, you can imagine it’s the steady white noise of the ocean which puts you to sleep. The chaotic motorway connects one unremarkable dingy town to the next. We asked a mototaxi driver for a suggestion in the last town and he said there’s no place recommendable and suggested we keep going. There’s a country club ahead. There, the guard suggests pushing through to Lima, his colleague suggests a turn off immediately after the upcoming bridge. And here we end up, in a gated community of colonial estates just off the main road, our beautiful guarded oasis. Mary by the Pool, she has flashy lights above her head at night. That’s Peru. We’ve been in South America for only a month and we’ve already seen so many fantastic places. We constantly get recommendations from locals which would probably all be worth an additional three week holiday. We took one advice of Daniel, a Frenchman who retired and is on a two year trip together with his wife in the Americas. (Check out their blog here.) They told us of the “Swiss Wassi” a little camping place and home of a Swiss-Peruvian couple directly over the boarder in Peru. We’ve decided to spend a couple days here in this wonderful family atmosphere with the sound of the South Pacific waves constantly present. It’s a wonderful place to reflect on the amazing month we’ve had. Ecuador is overwhelming and I can’t imagine how this trip could have possibly be better so far. The proximity of coast, volcanoes, Andes, Amazonia together with an abundance of friendly people and many new streets tempting us to stay longer and longer. However after three weeks of incredible roads and sites, we took a look at our 1:4 000 000 map and realized this is only the first inch and we have so much ground left to cover. everything’s bigger and prettier here. “Number 80” stretching its wings. Shuar is sturdy, alloes shelter and provides security with a chance to peak out. True craftsmanship of the Shuar. Even foul leaves and fruits are fascinating here. Blood red healing serum from a furry green leaf. Amazing Amazon. Chris Canaday shows us his waterless toilet. Surprisingly not quite as gross as it sounds. what a lake! this is in Sangay National Park. great roads and usually not too much traffic. how do they get those greenhouses to stay like that? this wasn’t even the steepest one we saw. very friendly ladies at the market. 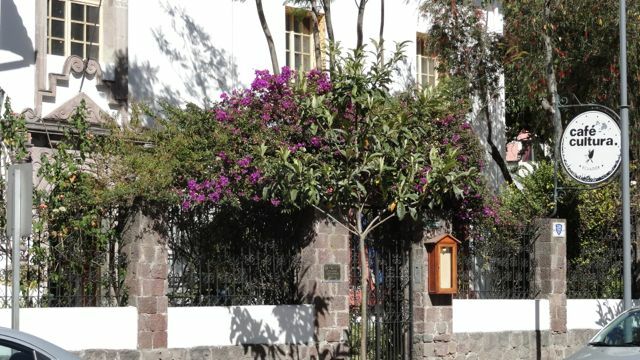 a beautiful little oasis in the midst of city life in Quito. It’s a protected architectural gem with beautiful gardens, cozy fireplaces, frescos and books everywhere, as well as a very kind and a devoted waiter to greet us every morning at breakfast. 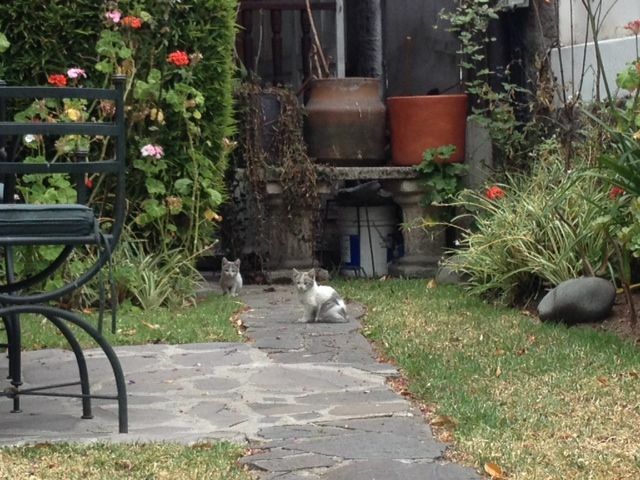 There are three curious, yet cautious kittens who don’t like to get close, but seem to enjoy listening to me when I do my Spanish lessons. It’s comfortable, we don’t have to worry about anything, and we can rest from the hectic weeks and months behind us. We can take time to really arrive while waiting for our bikes to show up. The guests here are passing through Quito for a variety of reasons. There are the multi-country “marathoners” maximising their vacation time, who see a blur of South America on their way home; a woman just re-acclimating to civilisation after spending weeks in the jungle studying a plague of snails; as well as a friendly couple escaping everyday in the Midlands. Most have one thing in common, Galapagos. They are on their way or just coming back. As big as my fascination for turtles and nature, and as enticing the stories of Darwin’s Beagle, our adventure is planned differently. We can imagine coming back for the sole purpose of visiting the Galapagos Islands. They would surely be worth a vacation all their own. Right now, I can’t wait to pick up our bikes and get started. It’s crazy that it’s already June and only about two months before we’ll take off on our trip. I’m starting a new journal. We’re conducting a little equipment test on a ride through the Altmühltal, which I hadn’t seen yet. I never knew this beautiful place was so nearby and I never could have experienced it more intensely then on a motorbike. It’s one beautiful scene after another, unfolding fields on patchwork hillsides. The beautiful colors in the setting sun and the long shadows on the meadows of the trees, and of my bike and me. It was my first longer ride with panniers and it made the handling a little different because of the extra weight. The biggest difference I noticed was in stopping and taking off, and maneuvering on steep and narrow roads. Basically anything slow took a lot more effort than usual. We camped and I tried to imagine how it would be out on the road for six months. The whole concept of time has been occupying my mind throughout the preparation. Counting down the days, and then suddenly I’d have more free time at once than I’d had in years. I would thinking back six months ago. That’s how long it the trip will be. Time stretches, shifts and reshapes as our perspective changes. I started practicing being present in the moment, so that I can experience the travels in a mindful and present way as well. I resisted the urge create a paper chain to count down the days (I did this many times in my childhood), but they whizzed past anyway and here we are, testing gear and I can’t even imagine what all we have to accomplish before we leave. We are beginning to live from one checklist to the next. One point on the list is a blog. Everyone is asking how we’ll share. Although we still don’t have a name for the blog (and I really have no time and nerve for it right now with so many other things to think about), lots of ideas come to mind as I was enjoying the rural scenes and gentle curves of the Altmühltal. They always seem so clear and worked out while riding, then I sit here trying to reconstruct them. I’m thinking about the events leading up to the trip. Me experiencing travel on two wheels and learning to ride the motorbike, the preparations and all the help and encouragement I received. I’ve noted down several topics which came to mind while riding this weekend, and I’m sure they will all come up in the yet unnamed blog.